President Donald Trump, speaking from the White House, makes an offer to end the shutdown. He went to Dover Air Force Base in Delaware earlier in the day to meet with families of Americans slain in Syria. (Washington Post photo by Jabin Botsford). Trump said Senate Majority Mitch McConnell, R-Ky., will put the legislation on the Senate floor for a vote next week. But House Speaker Nancy Pelosi, D-Calif., called it a "non-starter" and implored Trump to take action to open the government. 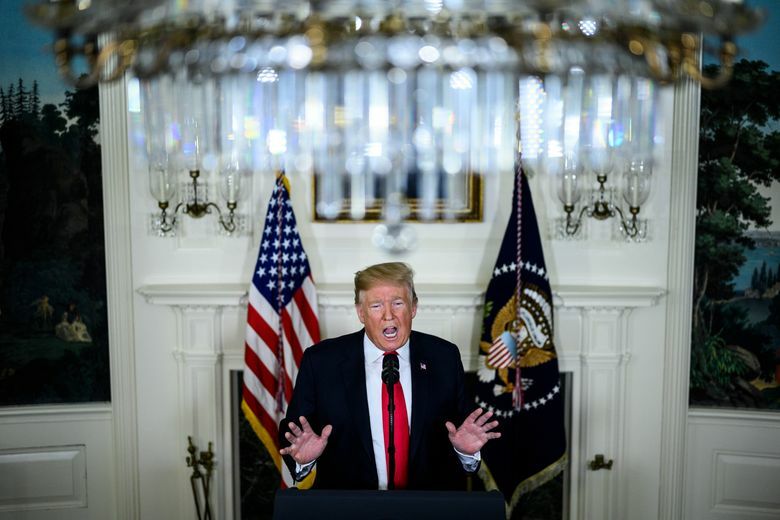 WASHINGTON – President Donald Trump on Saturday offered Democrats three years of deportation protections for some immigrants in exchange for $5.7 billion in border wall funding, a proposal immediately rejected by Democrats and derided by conservatives as amnesty. The shutting down of some 25 percent of the federal government was triggered by Trump’s demand for $5.7 billion to build more than 200 miles of new wall along the U.S.-Mexico border. Pelosi has called the wall “immoral,” and Democrats are refusing to offer more than $1.3 billion, maintaining existing funding levels for border barriers and fences. Democrats also frequently point out that Trump long claimed that Mexico would pay for the wall. The Washington Post’s Paige Winfield Cunningham and Erica Werner contributed to this report.